What more can be said about such a pioneer in sports like Michael Jordan? In his illustrious career, Michael Jordan made one of the most innovative moves at the 1988 All-Star Slam Dunk Contest in Chicago Stadium. While facing Dominique Wilkins in the final round, MJ took a slow dribble until he hit full speed at midcourt, planted his left foot at the free-throw line and launched into the air before slamming it home to the amazement of everyone watching. 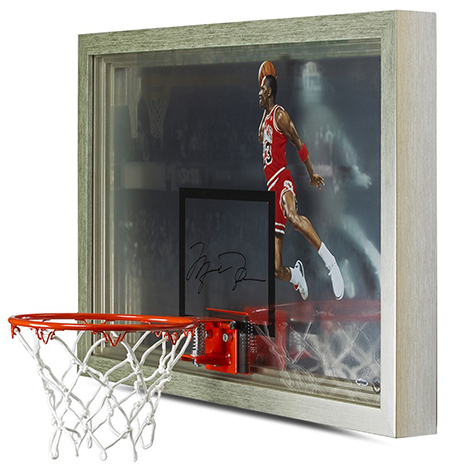 Wearing the Air Jordan III’s, he is seen here midflight in this Upper Deck Authenticated backboard. It features an actual breakaway rim attached to an acrylic backboard that measures 28.75” x 16.75”. The image has been duplicated with a ghosted image to give it a 3-D effect with the crowd and rim in the background. 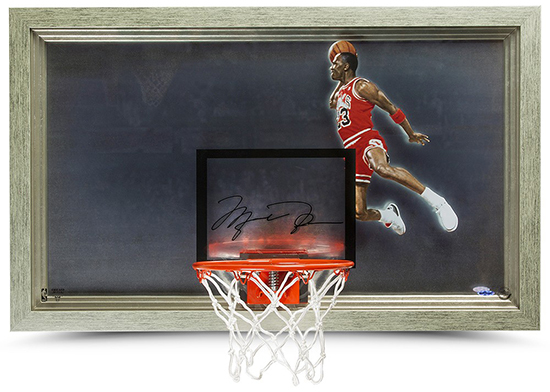 Relive Jordan’s winning performance and take this piece of history home.